What is a Social Media Marketing Strategy? A well planned out social media marketing strategy can be a vital part of your business strategy. This is why it is important to understand what a strategy really is. And what good strategies look like for social media marketing. First, let’s talk about why social media is important? These social networks offer feature to connect, interact and socialize with each other. You can stay connected to people you know. You can connect with people you don’t know. You can share media rich content with people. You can comment on other people’s content and respond to comments on your content. Each social media network offers opportunities to connect with new audiences. For any business to grow, connecting with new audiences should always be a target goal. The beauty of using social media for business is that you can interact with real people, in real-time. You can use social to build trust, loyalty and learn from their opinions. When you understand what your audience wants, you can create more opportunities to help them. You can create more opportunities to suggest your solutions to solve their problems. Strategy is a plan of action designed to achieve a specific goal. Marketing is the act of buying or selling in a market to reach consumers for the product or service. Social Media is online networks of people that allow them to connect and share different types of media with each other. A Social Meda Marketing Strategy is a plan to reach specific goals for selling and promoting products and services on social media networks. It is important to establish clear goals before you start marketing on social media. The basis of a good marketing strategy is to know what you want to achieve. It is hard to measure success if you do not know what results will make it worth your investment. Success can be measured by establishing clear marketing goals which are commonly referred to as marketing objectives. When looking at all of these objectives, it can be easy to want to achieve all of these objectives. A comprehensive marketing strategy will usually target all of these objectives. However, your marketing strategy should be broken down into different campaigns to achieve specific objectives. Once you define what you want to achieve, the next step is to create a plan for how you will achieve it. This plan can be referred to as a documented strategy plan, a content calendar or an editorial calendar. The idea is chart out plan that will get you to the goals you want to achieve. Taking the time to document your goals and define a clear strategy will improve the Return On Investment (ROI) for your time and efforts. If you are looking for a great social media marketing template, Hootsuite, provides a good free social media strategy template. When you are first starting out with social media marketing, you want to implement basic strategies first. You want to build a social community and have a plan to grow that community. 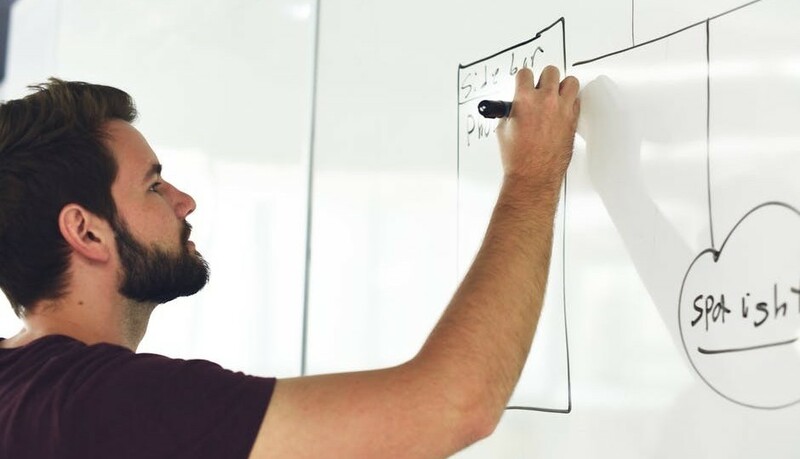 Without a solid basic plan to grow your community, you may miss out on the full advantages of using social media for business. So, back to asking, what is a social media marketing strategy? Let’s say your strategy is to create a social media community for your business. You want to create this community where you can be social with your current customers, be social with new potential customers and create a place where your customers and new potential customers can interact with each other. This can be great for people to get more information about what you have to offer and allowing your current customers to help you out with them. Here is an example 10 step plan to start a social community for your business. Step 1 is to research who you want to target. As mentioned earlier in this article, a strategy is a plan to reach a specific goal. And Marketing is the act of buying or selling in a market to reach consumers for the product or service. You can’t promote without people. You can’t sell without people. So if you do not know what type of people will be interested in your product or service, your strategy will be doomed from the beginning. Step 2 is to research the audiences within each social media network to identify which network has the right audience for your business, product or service. Social Media is online networks of people that allow them to connect and share different types of media with each other. Each social media network has its own unique audience of people to connect with and unique reasons of what those people want to achieve. Before you choose a social network to start growing your social community, you need to know which network has the audience you are looking for. 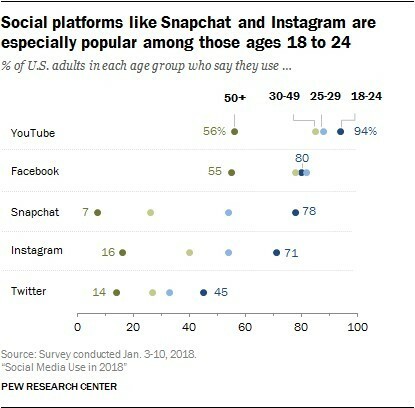 According to the Pew Research Center’s 2018 Social Media Usage Report, you will find Americans from the ages of 18 – 50+ on Facebook. For Snapchat, you will find a majority of younger people aged from 18 to 24. About 78% of this younger age group use Snapchat on a daily basis. Per the Social Media Marketing Industry Report by Social Media Examiner, Facebook, Twitter, LinkedIn, and Instagram are the top four platforms used by marketers. Facebook is the number one used network according to this report. Step 3 is to decide which social network would be the best one for you to start with. Research steps are extremely important. You need to choose the social media networks that have the right audiences and functionality for your target goals and your target audience. Choosing the wrong social network can prevent you from achieving your marketing goals, and end up being a complete waste of your time. For example, if you are selling custom printed socks, Facebook or Instagram are good networks to start with. These two networks are very consumer focused and offer many visual media options to share great photos of your products. If you are trying to hire more employees or find business partners to help expand your business capabilities, LinkedIn is a good network for you. This network is very business focused and offers easy ways to share business information and job postings. Once you’ve done your research, choose one social media network to build a social community within. The growing of a social media community takes time and commitment. The worse thing you can do is overextend yourself across to many networks at once. This will hinder the quality of your content contributions and interactions you have within your community. Step 4 is to actually create the page on the chosen social media network. Just about every social media network allows you to build a company page representing a business or a brand. After you completed your research, you are ready to create a page for your brand or business. For example, Facebook allows you to create a specific page dedicated to your business. Facebook requires that all business pages be created off of user profiles (e.g. real people). In other words, you can’t create a business page on Facebook as a person. You must already be on Facebook as a personal user (e.g. Kim Wolfe) or create a new personal profile before you can create a company page (e.g. i Kim Wolfe Brand Page). When you are logged into Facebook as your user, you will have options to create a Facebook page. Twitter on the other hand works differently. Each page on Twitter can either be for a person or a company. Each page requires a different email address. To create a personal page for you as a person, you use your personal email address. To create a business page for your product or service, you use your business email address. Step 5 is to personalize your page and fill out general page contents completely. All pages start out blank at first. It is one thing to create a company page for your business, product or service. It is another thing to completely fill out your page and customize it to your brand. It is important to be as detailed and thorough as possible in this stage. People to know what your page is about. People want to know why they should follow this page and become a part of your social community. When people come to your page, you want your page to look like your brand. You want people to recognize your brand from your social media page to your website. Step 6 is to share your page with your friends, family and your customers. Once your business page is created and has an established brand look and feel to it, you are ready to start promoting it. The easiest and free way to get the first few page likes is by sharing with your friends, family and your customers. Reaching out to your own personal social network is what social media is all about. It allows you to connect and socialize with people virtually over the internet. When you have something to say, it is easy to get the word out. You can promote your new page by sharing your page info on your personal social network profile, on your website or in emails. Don’t be pushy about it. Just create awareness that you have created a business page and you’d like anyone interested to go join it. Step 7 is to plan a calendar around consistent content to publish to your page. When building out your social network, you want to design a content marketing strategy. This includes what content you will publish and when you will publish it. A content calendar is part of the content marketing strategy which allows you to schedule out specific days to when you want to publish and identify what the content will be about. Step 8 is to include call to actions in your social content. A Call to Action is exactly what that says. It is a call to take some sort of action. Whatever action you want your fans and followers to take. You tell them what you want them to do. If you want your audience to click the link to go to your website, tell them to click for more information. If you want your audience to sign up to receive emails from you, tell them to sign up. If you want your audience to engage with your contents, tell them to like or comment. Step 9 is to include links to your website in your social content. Driving traffic to your website is a common marketing objective. Usually, your website is where you have more details about the products you sell or the services you want your social community to buy. Because social media is where the people are, it is easy to leverage these social communities to share your content with. Step 10 is to make sure you follow up with your community on a daily basis. When your social community leaves comments on your content, you need to reply in a timely manner. When your social community leaves you a question, you need to answer the question in a timely manner. When your social community is interacting with each other on your page, you need to make sure you are part of the conversation. Set aside time every day to go check your page and content and be social with community. What are the 10 Most Popular Social Networks? Feel free to to leave your questions below. I’d love to connect with you. What is the best social plugin you have tested so far? Honestly, I like the ones that come with my WP themes. Avada comes with built in social share links. It is pretty cool.